Amicable Lodge, from 1805 to 1838, and from 1845 to the present. Charity Lodge, from 1869 to the present. The Harvard Lodge, from 1922 to the present. Logia America Lodge, a Spanish-language lodge, from 1993 to the present. Mizpah Lodge, from 1867 to its merger with Faith Lodge in 1981. Mizpah-Faith Lodge, from 1981 to the present. Mount Olivet Lodge, from 1863 to the present. Putnam Lodge, from 1854 to its merger with Moses Michael Hays Lodge in 1978. Richard C. MacLaurin Lodge, from 1920 to the present. 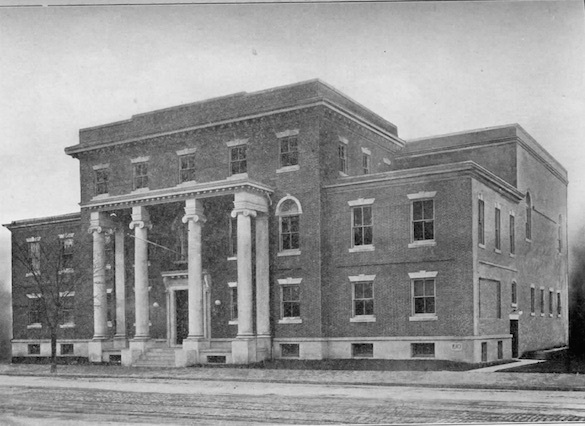 United Lodge, from 1924 to its removal to Brookline in 1930. 06/30/1910: 1910-114; Corner-stone laying, at a Special Communication; see below. 10/18/1911: 1911-145; Hall dedication, at a Special Communication; see below. The corner stone for the new Masonic Temple in Cambridge, Mass., was laid Thursday, June 30th. The ceremony was performed by Grand Master Dana J. Flanders assisted by the officers of the Grand Lodge. Interest in the event was testified by the presence of a large number of the fraternity. There was an informal lunch for the grand bodies at the residence of John C. Dow, one of the committee; following this the grand bodies were escorted to the site of the new temple h Cambridge Commandery, Cambridge R. A. Chapter and the five Masonic lodges of Cambridge. With the usual ceremonies the stone was placed in position and an address delivered by Rev. Dr. Frederick W. Hamilton, Master of Washington Lodge, Roxbury. After singing, the benediction was pronounced by Rev R. Perry Bush, D. D. The hymn sung at the beginning of the exercises was written for the occasion by Brother William R. Hyde. At the conclusion of the ceremonies a lunch was served to the special guests. The Masons of Cambridge, Mass., are looking forward with happy expectation to the day when their new temple will be completed. It is a long time since they enjoyed quarters exclusively their own. The new temple will be much more commodious and fine than anything they have before occupied. It will have a large hall with balcony, that will have a seating capacity of 400 without extra chairs. The entertainment and banquet hall will seat 500. There will be two small halls, a smoking room, office rooms, an armory and three coat rooms. The building will be used exclusively for Masonic purposes. It will be handsomely furnished and equipped with every modern convenience. The organ is to be an important feature of the furnishing. It will operated by the electro pneumatic system, the console will he detached and placed on the opposite side of the hall, the electric cable connecting the organ and console will contain over two miles of wire. The contract for the organ was placed with Estey Organ Co. through their Boston office. The new Masonic Temple at Cambridge, Mass., was dedicated, Wednesday, October 18th by Most Worshipful Dana J. Flanders, Grand Master of Masons in Massachusetts assisted by officers and past officers of the Grand Lodge. About 200 attended the banquet that preceded the exercises. The chair was occupied by Charles O. Welch, president of the Cambridge Masonic Hall Association. In addition to the Grand Master and staff, there were seated at the tables members of the councils and some past presiding officers of the eight Masonic organizations in the city. In the main assemblage hall a lodge was organized to receive the head of the craft, the five principal offices being filled by the presiding officers of the lodges in the order of seniority. A committee of all the Past Masters escorted the Grand Lodge to the chamber and the duty of introducing Grand Master Flanders devolved upon Past Master Lathrop of Amicable Lodge. The Grand Lodge was in part constituted as follows: Dana J. Flanders, Grand Master; Edwin K. Blodgett, Deputy Grand Master; Samuel Hauser, Senior Grand Warden; Walter F. Medding, Junior Grand Warden; Most Wor. J. Albert Blake, Past Grand Master; past Deputy Grand Masters Harvey N. Shepard, Everett C. Benton, William H. L. Odell, past Grand Wardens Wm. H. H. Soule, Frank W. Mead, Horace E. Marion, Joseph H. Gleason, Charles S. Robertson, and Henry G. Jordan; Thomas W. Davis, Recording Grand Secretary, and Harry W. Ballard, Grand Marshal. Worshipful Master Elmore, addressing the Grand Master, stated that the occasion of his visit among them was to inaugurate a new era for Free Masonry in Cambridge. The Craft in the city had long been in quarters that were inadequate and for years hardly dared to dream of a new temple. Thanks to the loyalty, devotion and generosity of the fraternity they were enabled to witness the realization of that wish. The Grand master pronounced it a pleasure for him to attend on occasions of this nature, for the Grand Lodge rejoiced with the fraternity wherever situated when its membership secured a temple devoted to the use of the Craft. After an anthem by a quartet, the grand officers assumed their chairs, and Grand Chaplain Bush offered prayer. Acting Grand Architect Furbush surrendered the working tools that had been entrusted to him and Worshipful Master Elmore requested that the building be dedicated. The Deputy Grand Master with the square, Senior Grand Warden with the level and Junior Grand Warden with the plumb were escorted about the different apartments and reported that the craftsmen had attended to their duty and the structure was in readiness. The grand officers assembled at their stations at the altar and the vessels of corn, wine and oil were presented to the Grand Master. In turn he dedicated the temple t< Freemasonry, Virtue and Universal Benevolence. The quartet sang a verse at the three intervals and the Grand Chaplain read the scriptural portion of the service. Grand Marshal Ballard proclaimed the temple "dedicated in ample form." The quartet sang the anthem, To Thee All Praise Be Given. Addresses of a congratulatory nature were delivered by Grand Master Flanders. Past Deputy Grand Master Shepard and Past Master Blair. The ceremonies closed with the dedication hymn, Hail Sacred Fane. This page was last modified on 17 September 2015, at 11:42.